It was such a beautiful, warm, eighty two degree day I decided it was finally safe to wear a skirt to church. I'm normally a pants kind-of-girl, but I do have a few skirts and dresses I pull out when the weather warms up. 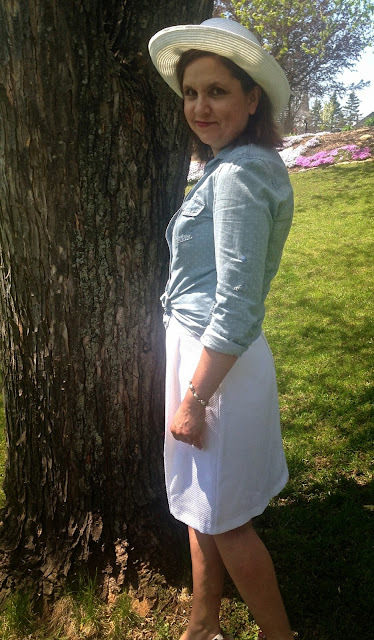 I have been looking for the perfect white skirt FOREVER! And I mean that literally! I started looking two years ago, and I could never find one until this season. And where did I find it? Why, J.C. Penney of course! It is a midi skirt with pleats and a texture similar to seersucker. And to make it even more perfect…it is lined! I never have to wear a slip nor worry that it is see thru. Thank you JCP for coming through for me again. The one I'm wearing is sold out already (Surprise! ), but HERE is another one I would buy if I didn't already own this one. 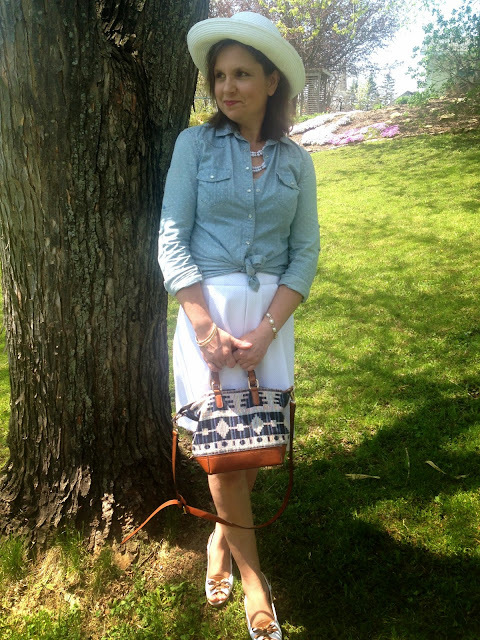 I wore my skirt with an old polka-dotted chambray shirt and a grey camisole. I tied the shirt at my waist. 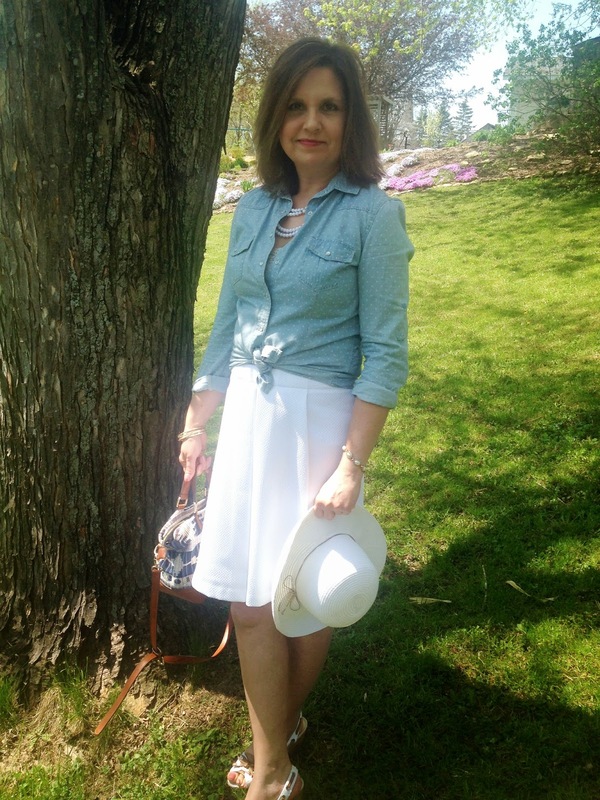 Because you know I don't like to dress too girly, I felt the more masculine chambray shirt really added a nice balance to the skirt, and the white polka dots matched perfectly. Hats just keep getting more and more popular every season, and I have been trying really hard to get on the bandwagon. I keep buying them, but I must admit I only wear them to outdoor events or when traveling. I don't know what it is, I love them on other people, but I feel very self-conscious in them. I did not wear the hat to church. Unless I'm having a bad hair day, I feel silly wearing a hat inside a building; especially a big sun hat like this one. So I put the hat on for the photographs only. 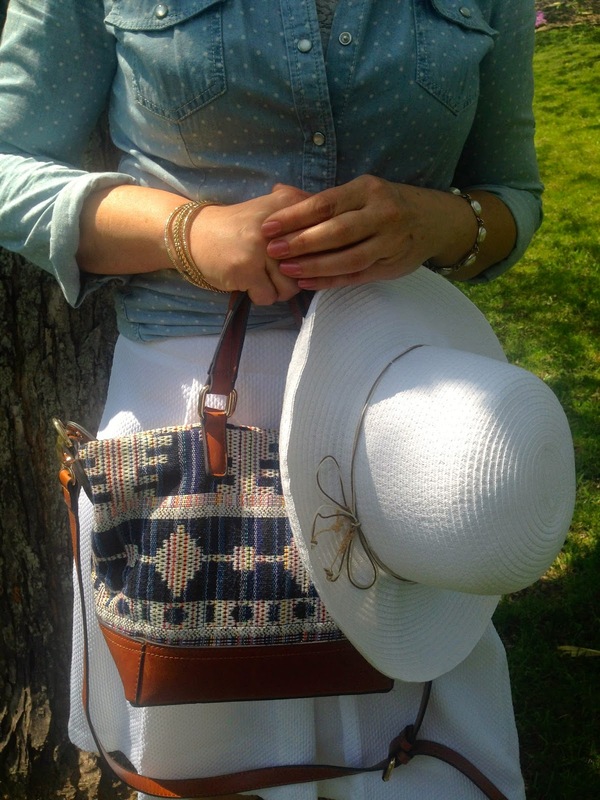 And if your wondering where I got it…well, it was another JCP find of course! And this hat is still available HERE. My jewelry is all very old: a white, multi-strand pearl necklace, and gold and pearl bracelets. 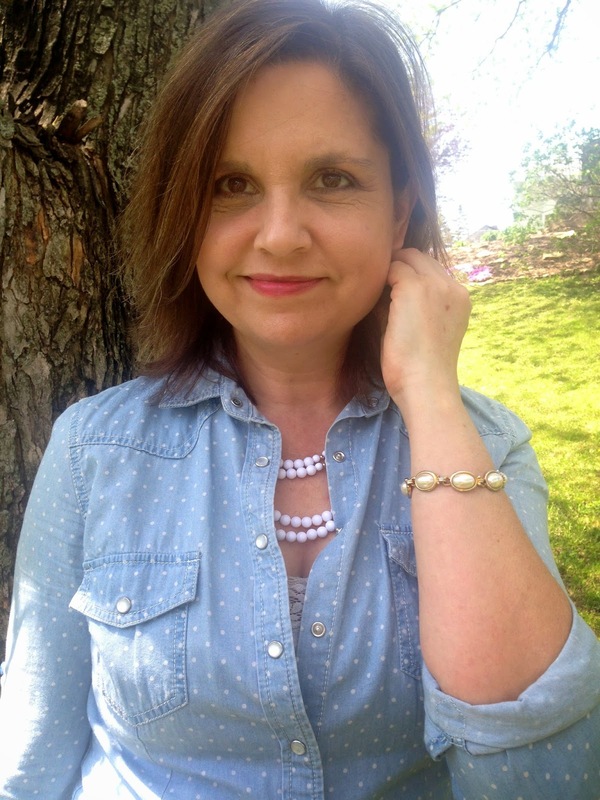 I really like how the feminine pearls softened the rugged chambray shirt. The past few seasons have been all about mixing masculine and feminine pieces. I've always liked the buttons on this shirt. They are pearl/silver snaps. Another mix of masculine and feminine built into the structure of the shirt. My boho bag was purchased last year from Francesca's. The hat has a pretty metallic and wax cord band. My shoes are several years old and I have shown you them many times before because I wear them a lot. They are my favorite white shoes and I will probably wear them till I wear them out. They go with just about everything, and they are very comfortable. So what about you? Do you wear hats or do you feel uncomfortable wearing them? What kind of hats do you wear? I'd love to hear from you! Linking Up With: Bloggers Who Have Inspired Me, Style Swap Tuesdays, Style Sessions, Confident Twosday, All About You, Turning Heads Tuesday, Reasons to Dress, Tucker Up, Jersey Girl, Texan Heart, Trendy Wednesday Mid Week Muse, Style Me Wednesday, Oh, Hey Girl!, I Feel Pretty, and The Trend Spin. Hi Amy. Your outfit is again great! Love the shoes. 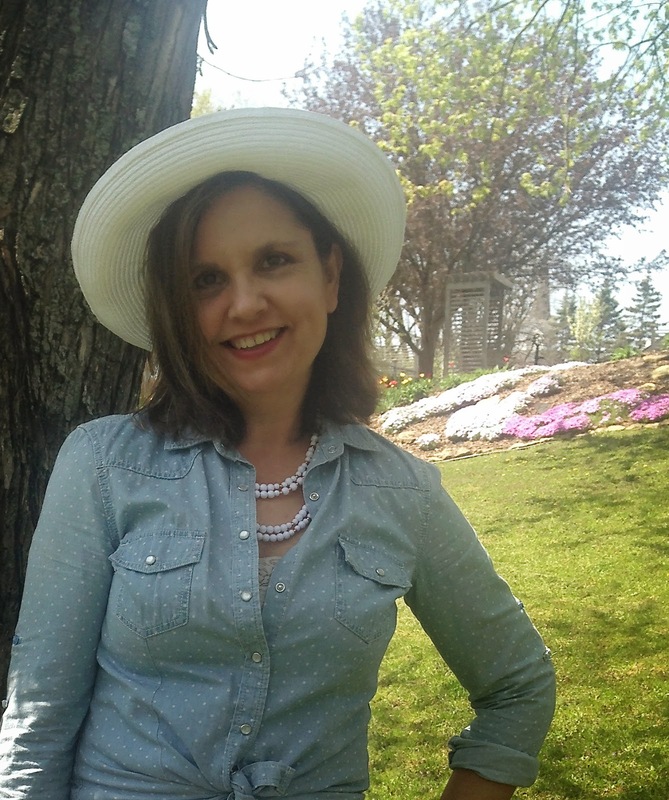 I am not a fan of heads but yours is ok.
That polka dot chambray shirt is the cutest and I love this summery outfit with the hat and super cute shoes. :) You look great! Thanks for linking up with Bloggers Who Have Inspired Me! I think this is my FAVORITE look of yours to date! Loving the chambray and that hat is adorable, what a lovely touch. Since moving to San Diego, I have learned to love hats. I wear either a baseball type hat (it doesn't have to be a sports team style) or a fedora. I just need the sun protection when we're outdoors for awhile! Love your outfit with the chambray shirt and perfect white skirt! Great look again, love the shoes! Not a hat person either. If I ever wear a hat it's because it's too cold outside :-) But sometimes the sun is so bright that it causes me a headache when it's shining right on my head, so I was thinking of buying one to wear outside in my backyard on those very sunny days. So darling!! The hat just tops off the cuteness! 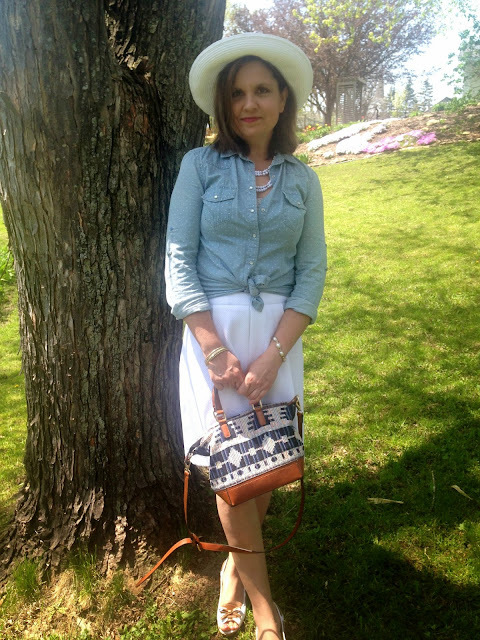 Beautiful look,love the chambray with the white skirt and I love hats too!